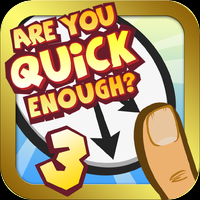 Are You Quick Enough 3 This game is only available on the mobile platforms above. Are You Quick Enough? 3 is the latest game in the hit series with over 5 million downloads. This latest installment has 24 never-before-seen mini-game challenges that will sharpen your brain and give you hours of enjoyment! All games and trademarks are copyright their respective owners. Contact Us if you feel Are You Quick Enough 3 has been used without proper permission.